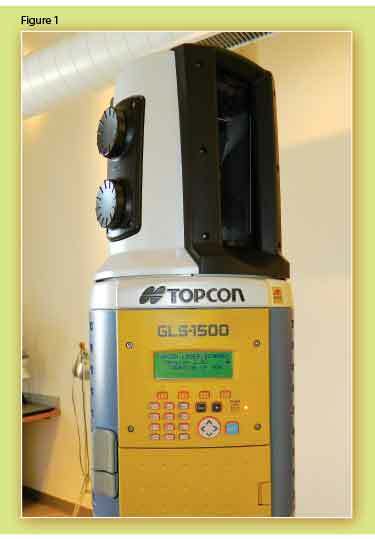 espite a late entry into the laser scanning market with their GLS-1000 (geodetic laser scanner) in 2008, Topcon Positioning Systems (TPS) has worked to make up ground with the recent introduction of their GLS-1500 model. While they certainly offer a variety of instruments with all the bells and whistles, I consider Topcon as a manufacturer of solid, dependable, “get the job done” equipment. This impression is supported by a statement on their website: “TPS prides itself on providing rugged, reliable, easy-to-use products that have been field-tested in order to meet rigid industry-leading standards.” And based on my recent experiences with the GLS-1500, I believe this instrument fits well with that business model. The GLS-1500 provides several upgrades to the original 1000 platform. It is oriented toward the surveying community, and some of the 1500’s visible features give it a “total station” feel. In addition to its standard tribrach mount, the surveyor will quickly note the dual knobs on the 360º rotating head (Figure 1). The horizontal and vertical control knobs are akin to the motions, or tangent screws, found on any total station. They are variable speed, and the motions are endless. The horizontal drive controls the motorized rotation of the head, while the vertical drive controls the movement of the internal mirror, which, in turn, directs the vertical location of the pulsed laser and camera. Any practicing surveyor familiar with this type of total station operation will quickly adapt to controlling the scanner in this manner. Another noticeable characteristic of the 1500 is its height. I received a tip about this early on from Chris Robson with CaronEast, the Topcon dealer who helped me get up to speed. He cautioned about setting the tripod too high when doing on-board scanning. This is because of an interesting peep-sight pointing method used on the 1500. 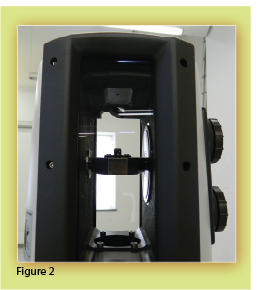 As seen in Figure 2, the mirror can be rotated to a horizontal position, which allows pointing the scanner via a peep sight on the reverse side of the mirror. Again, for those used to using a peep sight on a total station scope, this method will likely feel comfortable. The peep-sight method is possible because the vertical field of view on the 1500 is 70º, meaning the mirror deflects the laser beam from 35º above horizontal to 35º below. Some scanners on the market allow direct overhead scanning, so depending on the environment you’re scanning (e.g. interiors, bridges), this could be a drawback. With the 1500 this field-of-view limitation can be overcome in many situations by scanning from an additional direction. However, in many typical exterior environments overhead scanning isn’t a necessity. One could think of it this way: How many shots do you take with your total station with a zenith angle less than 55º? And remember, as noted above, the horizontal field of view is a full 360º. One feature I found interesting is the ranging process used on this scanner. As most of you probably know, there are typically two types of distance-measuring techniques used on scanners: time-of-flight and phase-based (or phase-shift). Generally speaking, time-of-flight gives longer range at a slower scan rate, whereas phase-based has much faster scan rates but at a much shorter range. The 1500 uses a combination of the two techniques, which I believe is unique. A source of confusion (and consternation) for surveyors and other scanner purchasers is the lack of consistency in specifications among manufacturers. Manufacturers will state their specifications in the way that makes their equipment look best. For example, some type of spec for distance accuracy is usually given, but this can be measured in different ways or at a specific distance in the scanner’s range. 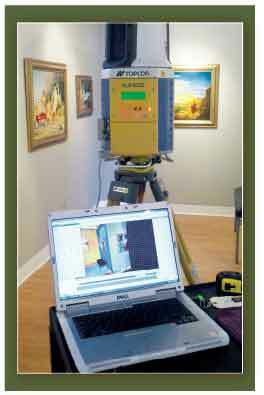 Topcon claims that their filtering system and use of both time-of-flight and phase-based techniques results in a cleaner, more accurate point cloud across the scanner’s full distance range. t right is the laptop/scanner configuration via the USB connection. Although somewhat physically limiting, this configuration allows for better access to both data and scanner. In addition, the on-board wireless connection removes many of the physical constraints. Below is a closer view of the laptop screen. At left is the scanner control dialog box, through which the user controls a variety of scan parameters (scan limits, resolution, images, etc.) and interacts with the scanner. 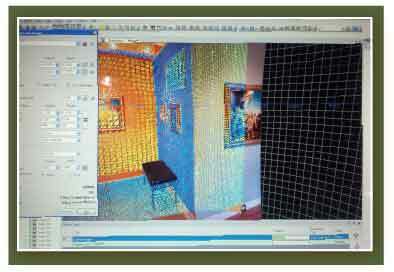 The main viewer window shows a partial image of the interior of an art gallery with the point cloud overlayed. The actual wall color, visible in the images, is gray. The orange, blue, and yellow colors visible in the point cloud are intensity-mapped values. Because the laser struck the walls at different angles, the return signals contain different intensity values and are rendered in different colors in the cloud. You can see that the user has better access to a much greater amount of information about both the scanner itself and the data being collected. Most of my scanning experience has involved controlling the scanner from a laptop. This is possible with the GLS-1500, and both USB and wireless connections are provided. I was able to get it up and running, connect it to the laptop, and start acquiring images and scan data within about an hour, which I consider reasonable the first time out. I’m a fan of scanning via laptop; I believe there are several advantages to this method, such as seeing what the scanner sees via the on-board digital camera (the 1500’s is 2MP) and seeing the point cloud as the data is collected. The majority of scanning I performed for this review, however, was done on-board. To facilitate this, the 1500 is equipped with a four-line text screen, an alpha-numeric keypad, four screen-defined function keys, and several other specific-function keys. Via these keys the user can navigate through a variety of menu-driven commands and enter all the basic information needed to perform a scan. The scanner also communicates information to the user via the screen, including battery level and total/remaining time to acquire images and scan data. It takes some time and a fair number of button pushes to navigate through the menus, but you can quickly learn the basic functions needed to complete a typical scan. As noted above, I was able to use some of the basic functions of the software within a reasonable amount of time, but I did not explore it in great detail. A dual-axis compensator is provided, which allows for more traditional survey functionality (backsight, frontsight from known station). The compensator can also be disabled to allow the instrument to be set up non-plumb (handy in some situations). 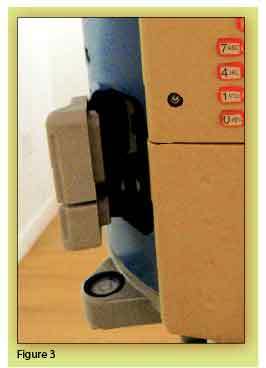 For on-board scanning, an SD card slot and a USB connection are provided (Figure 3). One nice feature is the connection covers that are a flexible, rubberized material, but with substantial connections to the unit that should withstand the wear and tear of everyday use. 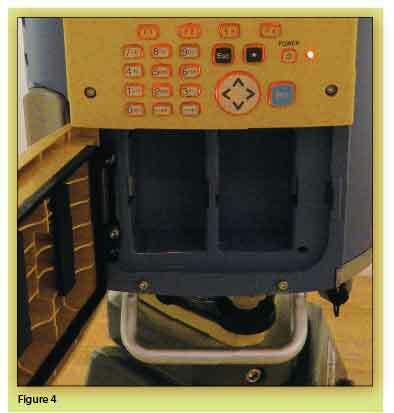 Figure 4 shows one of the two on-board battery compartments. The other is located on the opposite side of the unit’s base. Each compartment holds two lithium-ion batteries. I was supplied with four batteries, and the unit will run on only two, which allows recharging while you work. The batteries are hot-swappable, and I did get about two hours per fully charged pair, as the specs indicate. However, I would recommend purchasing an extra pair, as recharging did take longer than discharging. The laser itself is a Class 1, invisible, eye-safe beam, collecting 30,000 points per second. Something I noticed immediately about the 1500 was how quiet the scanner is. I’m not familiar with all the latest scanners on the market, and this may now be the norm, but anyone who’s been around scanning for some time knows that many older scanner models make a fair amount of noise. With this one, between the lack of noise and the invisible laser, I did wonder at times if I was actually collecting the data I thought I was. As far as I know, the scanner functioned properly for me over several days of scanning. The sticker price for the GLS-1500 is a touch under $90K, which places it at a mid-range price point. This seems in keeping with its capabilities compared to some others on the market. The 1500 does not have all the features found on some higher-priced models, but it seems to do a solid, dependable job as a data-collection tool oriented toward surveyors who want, or need, to provide scanning services but may not want to become completely subsumed by scanning.